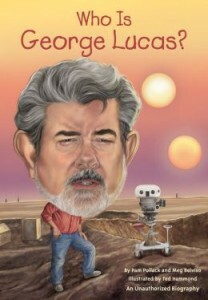 I was unsure what to expect from the book Who Is George Lucas? The title sounded interesting, but the book is clearly intended for a school age crowd. The moment I started reading the book I was captivated. A very easy to read page turner the book is filled with interesting facts and stories about the man who went on to play a major role in making so many movies that influenced and thrilled a generation of cinema goers. From reading about his childhood, and desire to be a race car driver — and how that actually turned him around and inspired him to become a better student, to reading about his teaching college courses to US Navy Cameramen while in college, I learned a great deal about the man who at one time considered making documentaries, and yet even in college was winning awards with his futuristic movies (Electronic Labyrinth THX 1138 4EB). The book presents a well-rounded view of the man who went on to make Star Wars, even when friends were telling him it was a disaster, teasing him about Princess Leia’s hair and the force. Covering his life, and accomplishments to date, Who Is George Lucas? is a fun and informative read for anyone wanting to know more about the man behind so many movies they’ve enjoyed over the years. This unauthorized biography Penguin was handing out at San Diego’s Comic-Con International is by Pamela Pollack and Meg Belviso, with illustrations by Ted Hammond. This entry was posted in Novel, Review and tagged American Graffiti, C3P0, Carrie Fisher, CCI, Clone Wars, Comic Con, Comic-Con International, Electronic Labyrinth THX 1138 4EB, Ewoks, George Lucas, George Lucas Educational Foundation, Grosset & Dunlap, Harrison Ford, Indiana Jones, Kevin McVeigh, Lucas Film, Lucasfilm, Mark Hamill, Meg Belviso, Pamela D. Pollack, Penguin, PopArtsPlace, PopArtsPlace.com, R2D2, San Diego Comic-Con, SDCC, Skywalker Ranch, Star Trek, Ted Hammond, Temple of Doom, The Raiders of the Lost Ark, Who Is George Lucas, Young Indiana Jones, Young readers on September 15, 2014 by Kay.